Sabrina Moreno, a proud Dominican, grew up in the Bronx, New York. Although she faced challenges in high school, she persevered and is now a sophomore at the State University of New York College at Plattsburgh where she is pursuing a degree in criminal justice. 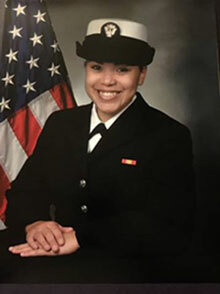 After completing her first year of college, Sabrina joined the United States Navy as a way to pursue her goals and give back to her community and country. Since graduating from boot camp, Sabrina has been training for her new job in the engineering field, and will be deployed in January 2017. Once she returns from deployment, Sabrina’s plan is to continue her education online and work towards becoming a Petty Officer in the Navy. Through her time in the Navy, Sabrina has learned the importance of being a strong leader, speaking up and giving other Hispanic students a voice. Since her CHCI experience, Sabrina has accomplished a lot for herself and for her community. The CHCI familia is incredibly proud of her, and looks forward to see the great influence she continues to have in her community. To support dynamic students like Sabrina and CHCI’s programs such as R2L NextGen, please visit: www.chci.org/donate.